BRAINERD, Minn. – Shawn Langdon might not have won a year ago at Brainerd Int’l Raceway, but the former Top Fuel world champion fondly recalls what took place thanks to stellar conditions during eliminations. Langdon ran an incredible 3.662 at 321.12 mph, setting a massive career-best elapsed time en route to a semifinal finish on a day that featured multiple runs in the 3.60s from Top Fuel standouts. Now feeling even more comfortable driving his 10,000-horsepower Red Fuel dragster as part of the Don Schumacher Racing team, Langdon, who won back-to-back races earlier this year, is hoping for similar conditions and results when he returns to Brainerd for the 35th annual Lucas Oil NHRA Nationals, Aug. 18-21. “Last year was my favorite year racing at Brainerd with those cool temperatures and great conditions,” said Langdon, who is currently seventh in the Top Fuel points standings. “We ran a 3.66 there and you just look at what took place last weekend in Seattle with the cooler temperatures. You see how good the racing is with those types of conditions and that’s what I live for. The race is the 17th of 24 events in the season and, more importantly, the penultimate race of the regular season before the Mello Yello Countdown to the Championship begins. It comes at an important time for Langdon, who is looking to build momentum and possibly a top five starting point when the six-race NHRA playoffs begins. That will take another impressive performance in Brainerd, but regardless of what position Langdon is in when the Countdown starts, he strongly believes his team can compete for a championship. After a slow start, including five straight first-round losses to open the season, Langdon and his team, led by crew chief Phil Shuler, have found their comfort level over the summer. Langdon has lost just twice in the first round in the last 11 events, winning consecutive races in Bristol and Norwalk. But with an important stretch starting in Brainerd and continuing through the Countdown to the Championship, don’t expect Langdon, who won a Top Fuel world championship in 2013, to change his style. To do that and also get his third win of the season in Brainerd, Langdon will have to top a number of talented drivers, including points leader and reigning world champion Antron Brown. 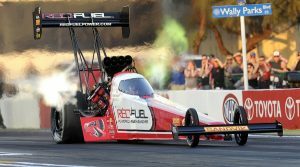 The star-studded list also includes three-time Brainerd winner and eight-time world champ Tony Schumacher, three-time 2016 winner Doug Kalitta, J.R. Todd, who won in Sonoma, Texan Steve Torrence, Brittany Force, Leah Pritchett and defending event winner Crampton. But after racing for DSR during the Countdown a year ago, Langdon has become even more acclimated with his team and the results of that have been apparent over the last few months.